ReviewMe: Ethical Alternative To PayPerPost For Bloggers To Get Paid? ReviewMe, a product recently launched by TextLinkAds, offers bloggers the opportunity to make money for writing product reviews. ReviewMe has a similar business model to PayPerPost.com which I questioned whether it was a potential splog generator last month. 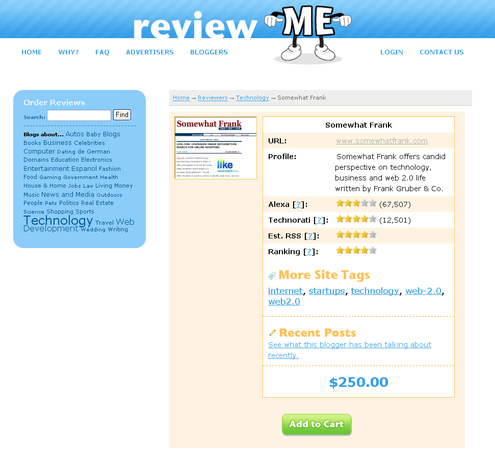 ReviewMe has improved upon the PayPerPost.com model by creating a ranked marketplace and currency for a blog post. ReviewMe does not promise a post will be positive and also has every paid review add a disclosure explaining the post is a paid write-up. This disclosure helps to maintain the credibility of both the blogger and the ReviewMe product. Also reviews need to be 200 words or more. With ReviewMe bloggers can actually capitalize on the time they spend reviewing a product, which in many cases is a product they would have reviewed anyway regardless of whether or not they were being paid. As I receive similar review leads via the blogosphere underground. Rev2.org recently reviewed the ReviewMe and explained that even though ReviewMe is better than PayPerPost.com in handling ethical concerns they would still never participate in the program. TechCrunch had similar feelings on the product. 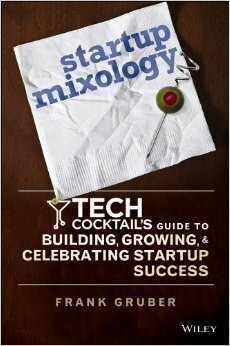 While others think getting paid for writing reviews might not be so bad after all. Understandably, there are also bloggers getting paid by ReviewMe to review the ReviewMe product. I just signed up for the service to test it out and I noticed that a number of familiar blogs like Google Blogoscoped, PaulStamatiou.com and TechnologyEvangelist.com were already signed up for the program. Upon claiming my blog I found that a post on Somewhat Frank can be purchased for $250 based on a ranking system that ReviewMe has put in place to determine a blog's value. Blog value takes Alexa, Technorati and other blog details into account to determine a rank. If I were to agree to write a post via ReviewMe, I would walk away with $125. However, this does not mean the review has to be positive in nature, it could totally tear the product to pieces and I would still get paid. So why wouldn't a blogger want to take part in this program. It is not asking you to lie about a product. It is just asking you to review it and be honest. I am interested to see how many and what types of requests I receive for product reviews since I only write about things that I find interesting. In my opinion, this model is very similar to being paid to be in a focus group for a consumer product. The only difference in the case of ReviewMe is that the focus group data is being exposed for the public to see in the form of a blog post. So I am extremely confident my current editorial filtration system will keep Somewhat Frank true to its distinct voice. I just hope the rest of the bloggers participating can show the same level of discretion. Bottom-line: Most bloggers would not mind getting paid. While advertisers and marketers might not know how to reach out bloggers for an honest review of their latest product. ReviewMe helps to solve this by creating a legitimate marketplace to connect products with reviewers. Sounds good but let's just hope bloggers can stay true to how they feel about a particular product and not fill the blogosphere with splog posts.